I’ve recently started working part-time again at my husband’s office. We are really blessed to be able to work together as a family. But add this to church services and activities, homeschooling, and everything else we have going on and it can make for a very busy schedule and a really messy house! After years of feeling behind at home or work, however, I’m determined to use what I’ve learned about organization and tidiness to help me maintain a “clean-enough” house during this season of life, especially since I just decluttered my entire house last month. 1) Put it away, right away. 2) Do something every day. I may not be able to thoroughly clean the house every day, but I can do something. I can unload and reload the dishwasher, run a load of laundry, or tidy the living room. Many days, I can do more than one of those but even when I can’t do a lot, doing a little bit helps to keep the house in decent condition until I can get to the rest. 3) Enlist help from others in the house. One really fantastic benefit of working outside the home right now is that it’s reminding me I should not be doing the majority of housework alone! My children make many of the messes and it’s my job to train them to take care of their things because constantly picking up after them is doing them a disservice. We can do a load of laundry together in hardly any time. Kitchen clean-up goes much faster when one person is clearing counters, someone is rinsing dishes, someone else is cleaning the table, and another person is sweeping the floor. Yes, we’re all tired, but pushing through for a few minutes together is great practice in perseverance. 4) Start fresh each week. 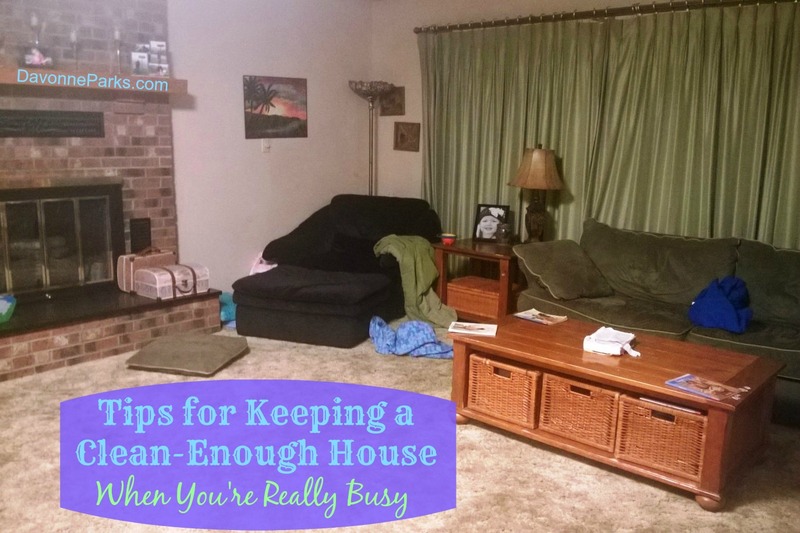 I’ve found that when I can make sure the house is clean and the laundry is caught up before I start a new work-week, it’s usually fairly easy to maintain a clean house throughout the week. Sometimes being able to start fresh means spending an evening or taking a Saturday to catch-up. On weeks I can’t start fresh, tips two and three are really helpful in keeping the house from becoming a complete disaster before we can clean it really well again. 5) Buy pre-made food when needed. I’ve mentioned that I make most of our food from scratch. I still do that, but sometimes it’s worth picking up a $5.00 rotisserie chicken when I’m already at Kroger then just adding rice and a vegetable at home. This allows me to use my limited house-keeping time to work on another needed task instead of cooking and kitchen clean-up. I paid for a teenage girl to help in my home one afternoon a week for two years. This was money very well spent! Now that Lily and Grace are almost nine and five instead of six and two (the ages they were when I hired someone), we’re able to work together to keep things clean but when they were smaller, the help was invaluable. 7) Keep a positive attitude. Things may not be as clean and organized as we’d like, but we are so blessed to have homes to live in, things to enjoy, dishes to eat on, clothes to wear, and people to love. And while we should be good stewards of our possessions, we also need to be okay with just doing our best even when our best is less than perfect. What about you? What tips do you have for maintaining a “clean-enough” home during busy seasons of life? My best tip to keep things clean when I’m busy: Lysol wipes. Also, the 5 minute trick, where I take 5 minutes to clean and organize what’s most visible if I walk from the entrance in. Those are two great tips – thanks so much for sharing, Angie!